One would think palm trees and turquoise water would mean world’s best beaches, but that’s not what you’ll find in Cozumel. There are fine strips of white sand, but not many. 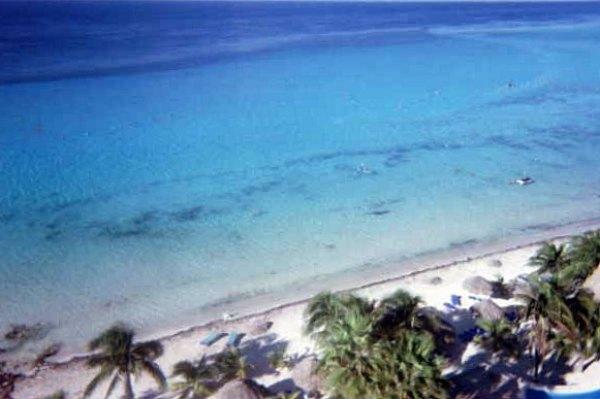 Cozumel developed on the side of the island with reefs, and the best beaches, we might add. That coast is sheltered by its proximity to mainland Mexico (12 miles to the west). There are beaches on the eastern side of the island, but you’ll need a rental car to get there. Playa (meaning “beach” in Spanish) San Juan runs along the northern hotel strip and is rock along with sand. It’s just to the north of the Melia Mayan Hotel. 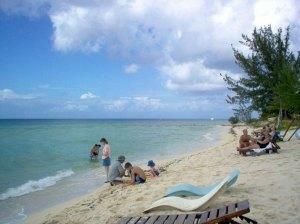 Loved by families, this favorite has plenty of shade, calm water, excellent windsurfing, and restaurants. What this means is that there is full-service here. So even if you forget something, chances are one of the shops will have it. Snorkeling is good off the beach along the rocky areas. Because of the sand runoff, coral does not grow except near the rocks. You can rent snorkel gear at the beach. There are some retaining walls built by the hotels in the area, but remember, in Mexico all beaches are public. Feel free to walk around the walls if the sand is better there. 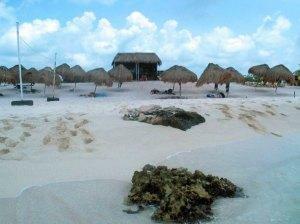 I will be traveling to Cozumel this month and would be happy to report on the condition of the beaches I find there.